The Commission on Education and Training (CET) of the International Cartographic Association is the standing commission designated to help the improvement of cartographic education and training worldwide. In the last period (1999Â–2003) one of the most important projects of the commission was to organize the Internet Cartography Teaching Program on the basis of the Basic Cartography. We agreed on the level of these courses and we decided to produce it at B.Sc. level. The next stage of the process was to create a list of the topics, define the modules and find the proper persons that were capable of writing certain modules. Dialogue rolling in the electronic medium. The paper would summarize the experiences of the two modules created by my department. The most exciting question was the filtering of the materials to define the imaginary B.Sc. level: we had to standardize the cartographic knowledge. The aim of cartographic courses is different in various countries and universities: some of them are focusing on GIS, some of them on geodesy, thematic cartography or map publishing. So we tried to define the B.Sc. level for each module. 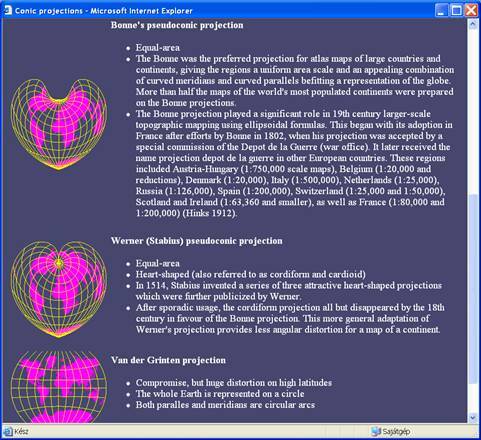 There were two modules: Map projections, and Graphic file formats and conversions. The first one is a relatively stable area; leastways the changes are not very dynamic. This area is well prepared, we could suggest additional literature for the potential students easily. The main question was the approach: would it be mathematic, scientific or are we only users and the technical information are less important. The second module is different, it is related to computer science, so the changes are rapid on this field. We had to write this module as software independent as possible, which is not very common. Most of the traditional university courses on this field are concentrating on certain software, but there are some truly international cartographic software products. We decided to describe standard formats, not certain software. Dialogue rolling in the electronic medium (distance learning, web materials). of course the computer based cartographic courses can be the skeleton of the whole project, but the courses must be as software independent as possible. may provide a standard for comparison with existing courses. The next stage of the process was to create a list of the topics and define the structure of modules. The number of planned modules (subjects) was about 20 and these modules would cover all subjects which are not country specific (like national topographic maps, national map history). There are probably no cartographic curriculum existing in any university or high school to include all the modules, but this is totally understandable. Nevertheless we would keep the content of certain modules as a minimum to teach on that level. Maps and cartography: principles in cartography, basic terms (together with the Theoretical Commission). Cartographic representation (this module would focus on the theoretical aspects, the practical questions would be discussed in other modules). Map Projections (two modules: the first is planned mostly theoretical-matematical and the second one would be more practical). Generalisation (this is a very important part of every cartographic curriculum Â– we planned 2-3 modules to cover the whole area of the cartographic generalization; we would use the main advantage of the web based course: to show several examples). Map use (this module can be useful in every structure: it is similarly important for GIS experts, map producers, geodesists, etc.). Topographic mapping (two modules: these kind of maps are used in every country as basemaps Â– the representation of relief, the navigation, the legend can be important part of the modules). Atlases (this module is relevent mostly in traditional cartographic courses, but can be important even for some GIS experts). Statistical map design (supplementary material for thematic cartography, interactive web techniques can be very useful to represent the possibilities). Colour use (this topic is more and more important nowadays, because colour printing possibilities are easily accessable for the normal users). Toponymy (this topic can be thought-producing for everybody who previously delt with any parts of cartography). Reproduction techniques (traditionally this involved only offset printing, but the digital processes and computer printing are much more important these days). Cartography and GIS (one of the key modules, the explanation of the relationship of these two disciplines can provide essential information). Databases (this topic is independent from cartography, but indespensable for cartographers dealing with GIS and computer cartography). Digital mapping (this is very complicated part which may require two separated modules: theoretical and practical Â– it is difficult to make it software independent). Graphic formats and conversion (this topic is not connected directly to cartography, but this module can summarize basic IT knowledge). Internet mapping (webcartography is the most Â“fashionableÂ” part of cartography in these days Â– incremental updating is a must). Legal aspects and copyright (this topic can be country specific). Most of the modules would require continuous update, so to ask experts to be responsible for a certain module would be a logical organization. The difficulty of this job is to think on international level and donÂ’t fit the module unconditionally to an existing cartographic course word by word. Of course this project was planned as a continuous work and the main problem was that it was impossible to realize our plans. The recruitment of new CET members and the re-activition of previous members was not successful in this period. Even producing one certain module would require the co-operation of several experts, but because of the lack of intention for participation in the project none of the projects may be regarded finished. The above list of modules is not a complete enumeration, for example modules about map history, remote sensing can be useful in most courses. Unfortunately this project didnÂ’t become well known for cartographers, we havenÂ’t reached the Â“critical massÂ” to mkae the project self-developing. The first CET meeting was organized in Budapest in February 2000. There were only a few participants (http://lazarus.elte.hu/hun/dolgozo/zentail/ica/cet-part.htm) and this tendency continued on the next meeting in Apatity (Russia) in August 2000. The whole project was planned to be based on the collaboration of cartographic experts from different countries. Instead of working on the modules the few participants of meetings discussed on the structure of the teaching materials and on the potential problems. The first sample module was created by our department (Projections) and the first version was ready for inner discussion on July 2000. We developed another sample module in the last CET period (written by me): Â“Graphic file formats and conversionÂ”. The third module Â“Methods of cartographic representationÂ” was developed by Anton Ryazanov and Vladimir Tikunov (Integrated Mapping Laborotary Geographical Faculty, M.V.Lomonosov Moscow State University). A template was developed by Barend KĂ¶bben (ICA, Netherland) in 2002 to methodically and graphically finetune the project. This suggestion can be a base of the next modules if the commission agrees on this structure. All three modules were treated as samples by the authors and now I try to summarize the experiences. I was directly involved in two modules. the authors have to refer to literature in the course which can be accessible through the web. long (and wide) pages requires extended use of scrolling bars which can be troublesome for most users, the suggested resolution is 1024*768 pixels. The Â“Map projectionsÂ” module summarizes a relatively stable area; leastways the changes are not very dynamic. This area is well prepared, we could suggest additional literature for the potential students easily. The content of the module can be easily organize into a logical small chapters. During the compilation the main question was the approach: would it be mathematic, scientific or are we produce this module only for ordinary users and the technical information are not important for them. The other module Â“Graphic file formats and conversionsÂ” is different, it is related to computer science, so the changes are rapid on this field (sometimes the changes are extremely rapid based on the development of the IT). We had to write this module as software independent as possible, which is not very common in this field. Most of the traditional university courses on this field are concentrating on certain software, but there are some truly international cartographic software products. We decided to describe standard formats, but not certain software. Software may disappear after some years, but the life-cycle of graphic formats looks more stable. The important part of the modules is the test. Questions can help the students to understand the content of the module and prepare them for the exam. The various levels of questions can be useful for the students to acquire the teaching material. We have to take into account the different level of students: for some of them the module can be one of the most difficult while for few of them this module can be quite easy. Of course the methods of testing highly depends on the topic. It was relatively easy to prepare lot of questions in different levels for the Â“ProjectionsÂ” module. But for the Â“Graphic file formats and conversionsÂ” it was more difficult. This module may contain brand new information for the students, so one of the main role of the test questions is to repeat the more important information of the module. The third module Â“Methods of cartographic representationÂ” is again something different. This is mostly a theoretical subject, but the logical structure of different methods may help to write good questionnaires. Hopefully the new Commission on Education and Training in the next period will continue this project and will be able to finalize all modules. These modules may help the ICA to give up-to-date teaching materials for cartographers to ensure the uniform level of cartographic diplomas on B.Sc. level.